CHICAGO, IL--(Marketwired - Oct 11, 2016) - JLL Income Property Trust, an institutionally managed, daily valued perpetual life REIT (NASDAQ: ZIPTAX) (NASDAQ: ZIPTMX) (NASDAQ: ZIPIAX) (NASDAQ: ZIPIMX), today announced the acquisition of Kierland Village Center, a 118,000 square-foot retail center anchored by leading national grocer Safeway. The property is located in the affluent Phoenix suburb of Scottsdale, Arizona featuring a complementary mix of necessity and service-based tenants. The purchase price was approximately $34.5 million. The city of Scottsdale is a thriving community that has seen a nearly 10 percent increase in population since 2000, and is projected to grow at twice the national rate through 2020. With median household incomes among the highest in the nation, the city also boasts a highly-educated population with 46 percent of individuals 25 and older having at least a bachelor's degree, significantly higher than the state and national averages. Located in Scottsdale at the southeast corner of 64th Street and Greenway Road, Kierland Village Center is a grocery / drug anchored shopping center within the affluent and established Kierland master-planned residential and resort area. 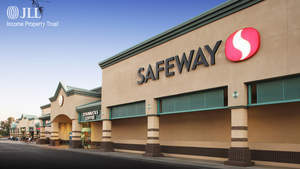 In addition to Safeway, Kierland Village Center tenants include other national retailers such as Walgreens, Baskin Robbins, Einstein Brothers, Panda Express, Pizza Hut, Subway and The UPS Store. "This acquisition demonstrates JLL Income Property Trust's investment strategy to acquire high-quality, well-located grocery-anchored neighborhood and community-oriented retail centers which should provide longer-term, durable income for our portfolio," commented Allan Swaringen, President and CEO of JLL Income Property Trust. "This is our 12th grocery-anchored retail acquisition, reflecting our retail strategy to expand our portfolio in key locations where convenient access coupled with positive demographic trends support our core investment thesis." JLL Income Property Trust is a daily valued perpetual life real estate investment trust (REIT) that gives investors access to a growing portfolio of commercial real estate investments selected by an institutional investment management team and sponsored by one of the world's leading real estate services firms. Jones Lang LaSalle Income Property Trust, Inc. is a daily valued perpetual life real estate investment trust (REIT) that owns and manages a diversified portfolio of high quality, income-producing office, retail, industrial and apartment properties located primarily in the United States. JLL Income Property Trust expects to further diversify its real estate portfolio over time, including on a global basis. JLL Income Property Trust, an institutionally managed, daily valued perpetual life REIT, today announced the acquisition of Kierland Village Center, a 118,000 square-foot retail center anchored by leading national grocer Safeway. The property is located in the affluent Phoenix suburb of Scottsdale, Arizona featuring a complementary mix of necessity and service-based tenants.